Description: Portuguese traditional handmade painted “RELIGIOUS LAST SUPPER OF CHRIST” tiles panel – This is a very exquisite panel with the “RELIGIOUS LAST SUPPER OF CHRIST” motive finely painted. XVII / XVIII reproduction. Quantity: 6 tiles Size: 42cm (16.5″) x 28cm (11″) x 8mm (each tile size 14cm x 14cm or 5.5″ x 5.5″) Artist: Susana Bretes. Origin: Estoril, Portugal Production method: Handmade, hand painted, XVI, XVII and XVIII centuries original technique Material: Pure clay, fine ceramic Approx. P R E S E N T A T I O N. The surface made with more Love per square millimeter in the World. The azulejo (tile) is the most typical and widely used form of decoration in Portugal since the middle ages up to now. Bicesse Ceramic Tiles began production in 1988. We manufacture our own tiles maintaining a high standard of quality and characteristics of the traditional tiles. Tiles are made of pure clay, squares with sharp edges and irregular surface, measuring approximately 140mm (5.5″) x 140mm (5.5″) x 10mm / 8mm thick. When used to restore and reproduce antique tiles it will be 1cm thick. They are glazed individually by hand, all decoration is also hand painted. We also reproduce contemporary designs from artists, such as Arch. Alvaro Siza Vieira, Menez, Paula Rego, Graça Morais, Lourdes de Castro, Maluda, Pedro Proença, Eduardo Nery and many more. Some places using tiles manufactured by us: FRANCE, PARIS – Buddha Bar; UNITED KINGDOM, LONDON – Buddha Bar; SPAIN, MARBELLA – Baja Disco; GRAN CANARIA – GRAN HOTEL “La Residencia”; UNITED NATIONS – UN; UNITED STATES – Lenny Kravitz – Residence; UNITED STATES, NY – Dr. Berezovsky, Pateo / Residence – J. Molyneux Studio; UNITED STATES, MIAMI – “Providencia 1878″, (Artistic panels for public spaces) – Preservation Foundation of Palm Beach – Smith Architectural Group; FRANCE – PAVILLON DE NATATION Prince Pierre D’ Aremberg; UNITED STATES, CALIFORNIA – “George Lucas Building II” USC School of Cinematic Arts – Urban Design Group – Hathaway Dinwiddie Construction Company; PORTUGAL, LISBON – Palacio Fronteira – Eduardo Nery; PORTUGAL – Traditional Public Market of Cascais; UNITED KINGDOM – Harrods Stores; GERMANY – Hotel Schloss Luebbenau; PORTUGAL – Quinta do Casal Novo; ROMANIA – La Trattoria “Il Calcio” – Arch. Marina Gingirof, Bsidesdesign; and much more.. Medal for Merit in Business Given by the Municipality of Cascais on 07-06-2008. Marking twenty years of activity in 2008, this commercial establishment constitutes a national reference in the sector of production, reproduction and handcraft restoration of painted tiles, one of the most distinctive components of the portuguese tradition of decorative arts. Recovering and applying the traditional methods of portuguese tile-making in prestigious works, in and outside the Country, Bicesse Tiles has thus served as a visit card of the Council, that has invested so much in the last years in enriching its historic-cultural heritage. Text: Municipality of Cascais. (09:00 to 17:30 GMT00:00). Contact: Luis Leal contact form. 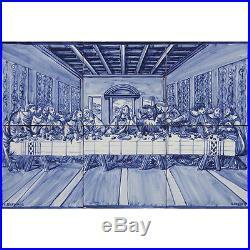 The item “Portuguese Traditional Blue Azulejos Tiles Panel RELIGIOUS LAST SUPPER OF CHRIST” is in sale since Monday, September 29, 2014. This item is in the category “Antiques\Decorative Arts\Ceramics & Porcelain\Tiles”. The seller is “euromkii” and is located in Lisbon, Bicesse. This item can be shipped worldwide. Tags: azulejos, blue, christ, last, panel, portuguese, religious, supper, tiles, traditional.